"U.S.A.! U.S.A.! U.S.A!" The chant rang out in Toyota Stadium right before kickoff of the recent soccer match between the U.S. Women's National Team and the Canadian National Women's Soccer Team."U.S.A.! U.S.A.! U.S.A!" The chant rang out in Toyota Stadium right before kickoff of the recent soccer match between the U.S. Women's National Team and the Canadian National Women's Soccer Team. 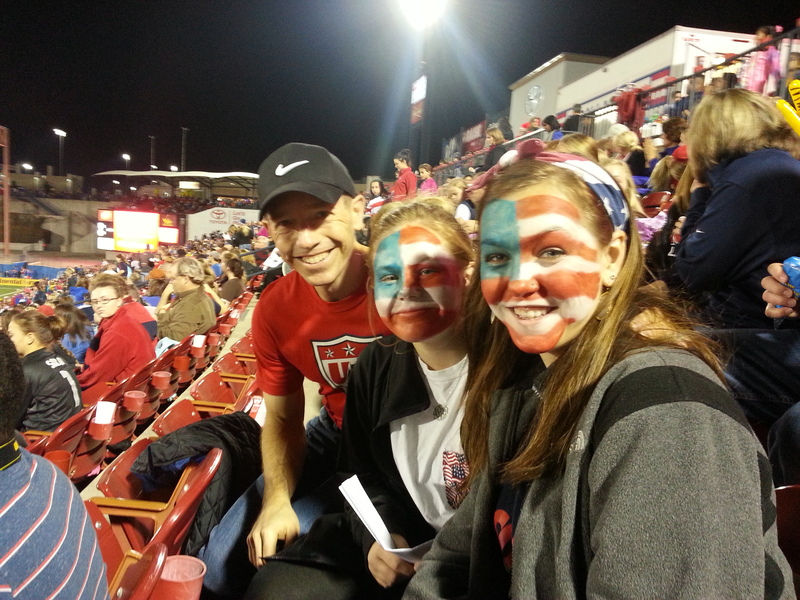 On a pleasant night in Frisco, Texas, my daughters and I--with a boyfriend of one of them in tow--joined the boisterous crowd of more than 20,000 cheering the U.S. on to a 1-0 victory sealed in the 79th minute by a goal from the lightning-fast Sydney Leroux. This victory was a great start to their 2014 season after enjoying an undefeated 2013 campaign. I can't wait for the World Cup in Brazil later this year. I just hope the U.S. Men's Team can escape their "group of death." I never thought I'd become so passionate about a game that most Americans know so little about. Perhaps I shouldn't be surprised by this passion given that soccer is the global game. When my oldest daughter started to play soccer when she was 4 years old, I knew very little about the sport aside from what I learned about it in college from several fraternity brothers who convinced me to play intramural soccer. Intramural soccer aside, my indoctrination into the sport began with what many parents affectionately call "beehive" ball. Beehive ball is marked by a bunch of kids converging on a soccer ball in what resembles a scrum in rugby that randomly moves from one part of the field to another in a mad dash to get to the ball as it continuously emerges from the beehive. Neither side plays with the classic shapes or formations that soccer fans know so well. There's no overall strategy or tactics (and almost no passing), just run as quickly as you can to the ball, kick it (hopefully, but not always, toward the opponents' goal), and try to score. After seeing a few games, I wondered when my oldest would tire of the game and move on to a sport that I enjoyed and knew a lot more about. My sports growing up were football, baseball, and golf. With two girls, football was out of the question. I hoped my girls might gravitate toward softball or golf. Both of them played the latter sport for a brief time, but soccer became their passion. I realized that I had to accept their passion and, as a result, learn more about the game. Fortunately, I started to enjoy it more as my girls aged, became more technically skilled and tactically aware, and started to play club soccer. I started to watch the English Premier League (EPL), Italian Serie A, and Major League Soccer. I became a huge fan of Aston Villa, an EPL club. As I reflect on this experience, I've learned a few things about enjoying sports with my children that can help you enjoy sports with your child. 1) Allow your child to make the choice about which sport(s) he or she will become passionate about. Don't force your child to play a sport simply because you played it or enjoy it. 2) Allow your child to explore different sports if he or she doesn't immediately gravitate toward one. Too many parents, sometimes at the urging of coaches, force their children to choose one sport at an early age. That's a mistake on two fronts. First, it teaches children they aren't in control of their own lives and that their parents' goals and dreams (for their children) are more important than their own. Second, it can actually hurt their chance to develop to their full potential in a sport. As Brad Hatfield chair of the kinesiology department at the University of Maryland says, playing multiple sports increases the chance that children will develop to their full athletic potential. It took my youngest daughter several years to choose soccer as her sport. She explored ballet, gymnastics, and golf before choosing "the beautiful game." 3) Learn the sport your child chooses if don't know much about it. You don't necessarily have to enjoy the sport. Just become knowledgeable about it. I can't tell you how many soccer parents think they know a lot about the sport when they know so little. Their lack of knowledge leads them to say really stupid things. 4) Don't live vicariously through your child. Parents sometimes push their children into sports the parents loved because the parents didn't accomplish all they had hoped to in the sport when they were children. (Parents don't have to have played sports to live vicariously through their children's sports.) Parents who live vicariously through their children are often the most belligerent, loud, and foul-mouthed parents who yell at game officials, coaches, and other players. (They also tend to be the least knowledgeable about the sport.) All they accomplish is embarrassing themselves and their children. 5) Attend sporting events together. If there are professional or college teams in your area of the country in the sport(s) your child enjoys, take every opportunity to attend sporting events together as another way to show your commitment to your child's decision to play that sport. Attending these events will also increase your knowledge of the game. Take your child to events in other sports as well. The fact is most children enjoy sports that they don't play. In addition to attending professional and college soccer matches, my girls and I have attended minor league hockey and baseball games. What are you doing to enjoy sports with your child? Are you doing everything you can to allow your child to choose his or her sport(s)?